Limited-edition gift set! Gift that special someone (or treat yourself) with the Muroto Volume shampoo and conditioner duo. muroto volume conditioner [250 ml]: hydrates and tones hair while enhancing volume and body. 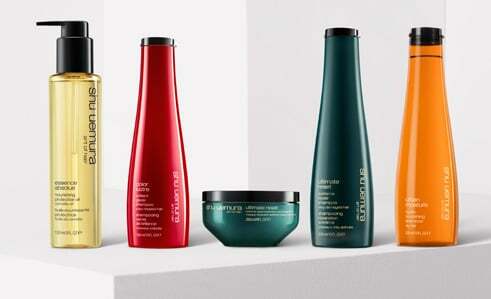 Shampoo: Aqua / Water ● Sodium Laureth Sulfate ● Cocamide Mea ● Glycerin ● Coco-Betaine ● Laureth-5 Carboxylic Acid ● Isostearyl Neopentanoate ● Hexylene Glycol ● Ceteareth-60 Myristyl Glycol ● Sodium Benzoate ● Sodium Chloride ● Peg-55 Propylene Glycol Oleate ● Propylene Glycol ● Polyquaternium-10 ● Salicylic Acid ● Maris Sal / Sea Salt ● Butylphenyl Methylpropional ● Alcohol ● Benzyl Benzoate ● Benzyl Salicylate ● Benzyl Alcohol ● 2-Oleamido-1●3-Octadecanediol ● Magnesium Sulfate ● Safflower Glucoside ● Gentiana Lutea Extract / Gentiana Lutea Root Extract ● Sodium Hydroxide ● Citric Acid ● Parfum / Fragrance. Conditioner: Aqua / Water ● Hydroxypropyl Starch Phosphate ● Quaternium-87 ● Glycerin ● Stearyl Alcohol ● Alcohol ● Tocopherol ● Sodium Citrate ● Phenoxyethanol ● Acetic Acid ● Safflower Glucoside ● Magnesium Sulfate ● Behentrimonium Chloride ● Trideceth-5 ● Trideceth-10 ● Polysorbate 20 ● Candelilla Cera / Candelilla Wax ● Benzyl Benzoate ● Benzyl Salicylate ● Benzyl Alcohol ● Gentiana Lutea Root Extract ● Propylene Glycol ● Amodimethicone ● Isopropyl Alcohol ● 2-Oleamido-1 ● 3-Octadecanediol ● Caprylyl Glycol ● Maris Sal / Sea Salt ● 250Ml/8Fl.Oz Butylphenyl Methylpropional ● Bht ● Parfum / Fragrance.